Comments: Brand New beautiful hardcover copy. 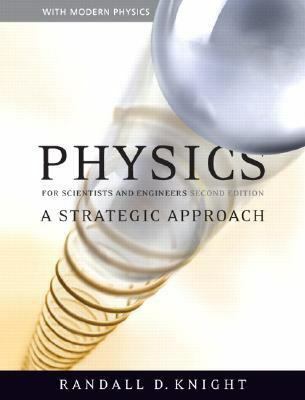 The package for Physics for Scientists and Engineers includes: Physics for Scientists and Engineers: A Strategic Approach with Modern Physics, 2/e (text) Student Workbook for Physics for Scientists and Engineers: A Strategic Approach with Modern Physics (workbook) MasteringPhysics® Student Access Kit (access kit)As the most widely adopted new physics text in more than 50 years, Knight's Physics for Scientists and Engineers was published to widespread critical acclaim from professors and students. In this eagerly awaited second edition, Knight builds on the research-proven instructional techniques he introduced, as well as national data of student performance, to take student learning even further. Knight's unparalleled insight into student learning difficulties, and his impeccably skillful crafting of text and figures at every level from macro to micro to address these difficulties, results in a uniquely effective and accessible book, leading students to a deeper and better-connected understanding of the concepts and more proficient problem-solving skills.Building on an NSF-sponsored educational research program and input from tens of thousands of student users, the second edition refines and extends the pedagogical innovations that years of use has now shown to be effective. Unprecedented analysis of national student metadata has allowed every problem to be systematically enhanced for educational effectives, and to ensure problem sets of ideal topic coverage, balance of qualitative and quantitative problems, and range of difficulty and duration.The second edition comes with the latest edition of MasteringPhysics'„¢ the most advanced, educationally effective (as shown by gains in student exams scores and independent tests), and widely used online physics tutorial and homework system in the world. It provides the largest library of research-based tutorials and textbook problems available, and automatic grading of activities as wide-ranging as numerical problems with randomized values and algebraic answers to free-hand drawn graphs and free-body diagrams.Knight, Randall D. is the author of 'Physics for Scientists and Engineers A Strategic Approach With Modern Physics and Masteringphysics', published 2007 under ISBN 9780321513335 and ISBN 0321513339. Loading marketplace prices 9 copies from $20.43 How does the rental process work?